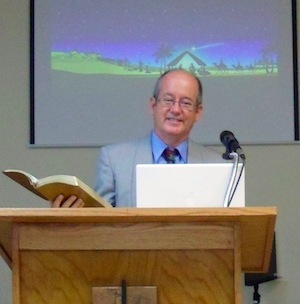 As a pastor I have the joy of dedicating my time to the study and exposition of the wonderful Word of God. In Scripture there are many precious promises, But none is greater than God's promise of eternal life through our Lord Jesus Christ. He Himself said of His mission: "I have come that they may have life, and that they may have it more abundantly" (John 10:10). God is calling a people to be “kings and priests” (Revelation 1:6) from among all nations, that will live with Him in love (Revelation 5:9). “But God commends His love in that, while we were yet sinners, Christ died for us” (Romans 5:8). Jesus lived a sinless life, then died for our sins, that we would not have to (Hebrews 10:10-12), then rose again, victor over death. This is the Good News (1 Corinthians 15:1-8). This gift of eternal life is received by faith alone. “For God so loved the world that He gave His only begotten Son, that whosoever believes on Him should not perish, but have everlasting life” (John 3:16). It is a free gift, apart from works (Ephesians 2:8-9). It is my heartfelt prayer that you too would turn from depending on your own works and righteousness and put your faith in Him!